Farmer Boy Ag is pleased to announce that Kane Manufacturing, the manufacturer of livestock products for over 30 years, is now producing two new Pink Sorting Panel for hog producers. Using the same engineering and fabrication processes as done in the manufacturing of the traditional red and black sort panels, these new Pink sort panels are top of the line. 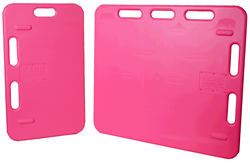 Farmer Boy Ag is pleased to announce that Kane Manufacturing, the manufacturer livestock products for over 30 years, is now producing two new Pink Sorting Panel for hog producers. Due to popular demand by the latest generation of show pig enthusiasts, Kane Manufacturing started doing research on the popularity of this request. The research showed pink, pink and more pink pushing its way into the show pig arena. Using the same engineering and fabrication processes as done in the manufacturing of the traditional red and black sort panels, these new Pink sort panels are top of the line. Designed to move animals with ease, Kane sorting panels are light-weight and extremely durable. Rounded hand grips on the top and side make for easy handling. Choose from a variety of different sizes or combine panels with the drop pin hinges available. Double panels are perfect for large alleyways, pens and standalone tasks such as marking and medicating. The small 18-inch Sow Mate was specifically designed to back sows out of gestation stalls and farrowing crates. Light-weight and small, its perfect for younger members of your crew and can easily be manipulated with one hand. Farmer Boy Ag along with Kane Manufacturing is truly excited to bring this new product to our customers. Farmer Boy AG, Inc. has been at the forefront of the livestock and poultry industry, constructing facilities for these industries as well as providing a complete line of parts and supplies to keep those facilities running for years to come. Regardless of market conditions, Farmer Boy Ag strives to give customers “The Best Value in Ag Supplies!” For more information on the Pink Sort Panels, contact the Farmer Boy AG Sales Department at (800) 845-3374.